I wish I could tell you how cool this is. With those words uttered by his best friend during an online chat, Austin Stone, a high school senior, forces himself to accept the fact his friends are leaving him behind. His only escape is playing an online space simulation, Star Runners. It seems to be the only environment in which he excels. However, being a champion Trident Starfighter isn't something you want to brag about in public nor will it help earn a scholarship. But as soon as Austin is about to give up on college he reaches the top of the elite server. He receives an invitation from a school shrouded in secrecy promising to unlock his hidden potential. With no other options, Austin takes the offer. What Austin doesn't realize is that his dream of going to college has just opened up the cosmos and will challenge everything Austin thinks he knows about himself and the universe. Overall I thought this was a worthwhile listen and well worth the credit. Even though it kept my attention, I did find it pretty predictable and thought it ranked in the category of "Simple Young Adult" story rather than true science fiction. The storyline follows a young male just graduating from high school roughly a year after the death of his father. He has aspirations of college, but he and his single mother can't afford the tuition. During his free time he and his best friend play a space dogfight-type video game on the internet. Both are in the top 5 players in the game worldwide. After his best friend wins the top spot on the game's rankings, he is offered a scholarship to a mysterious elite university. A year later when the main character beats the one person in the game who has never been beaten and also reaches #1, he also gets offered a scholarship to another elite university (where mysteriously everyone seems to be a player of the same online space video game). To make a long story short, the video game played by all of the characters is actually a simulation for real-life space fighters. As it turns out, the space navy for the human worlds in our area of the galaxy uses earth as one of its recruiting grounds (unbeknownst the the people or governments of earth). The story was definitely interesting and I didn't get board while listening, but it did have it's downsides... Firstly, I found the entire book VERY predictable. I knew exactly where the storyline was going and there were essentially no surprises at all. Also, although I have listened to a lot of different Science Fiction books and series, I do generally like there to be SOME science. I don't need to be walked through an hour explanation of how something works, but I do like there to be some explanation or justification of the technology used in the story... This book had almost nothing to that end. The narrator was actually pretty good, but there were a few places that I lost track of which character was actually speaking, so I only give 3 of the 4 or 5 stars I usually give to narrators. Story gets 3 stars because of its predictability and lack of innovation. However, I'm giving an overall score of 4 stars because, as I said, I did enjoy the book and the story. This past week I've had the good fortune to find 3 of my favorite listens with the last one being Star Runners! BUT with Star Runners, as with the other 2, it's a series of one! Never again! I will check " see series" and make sure there's at least 2 books in the series! Now I'm possession of a list of at least six of these 1 book teases, trying to be patient and with fingers crossed that none scrape by me when they're released. The only reason I have a date for one is I'm welcome to prebuy! But venting aside this was a fun, engrossing book that had what I like: a John Wayne western set in space. You know the kind with plenty of action,with strong good guys, and just enough romance to tell the handsome males from the winsome females. There's even the cagey mentor and the young hero that will ultimately save the day. Too cookie cutter for many but it's the listens I enjoy. The narrator does a good job but I was worried when I first started the book because he started in a flat, almost monotone, reading. It didn't last long. My only complaint about the author is he was wordy and took too long to set up his prime characters. Once everyone was "away at school", things proceeded along at a good pace but I feel the author could have blue lined one chapter for sure, maybe more. Like the concept of space westerns? Ante up a credit! Solid 3 stars, it was a fun story that kept me fairly interested. The narrator did a par performance but every time someone shrugged (which happened quite often) I cringed when he said they "shrudged." I was really impressed with the story. The most frustrating part of the whole experience was the bad narrator choice. Great tale for teenage boys who don't otherwise enjoy reading. The author has talent for writing flight and battle scenes. Character development and conflict, not so much. Conflict was very 2 dimensional and unsatisfying. Lots of questions remain unanswered for next few books. Star Runners was a welcome surprise: what could have been a rather silly retread of The Last Starfighter wass actually an engaging and decently written story with a grounded main character. 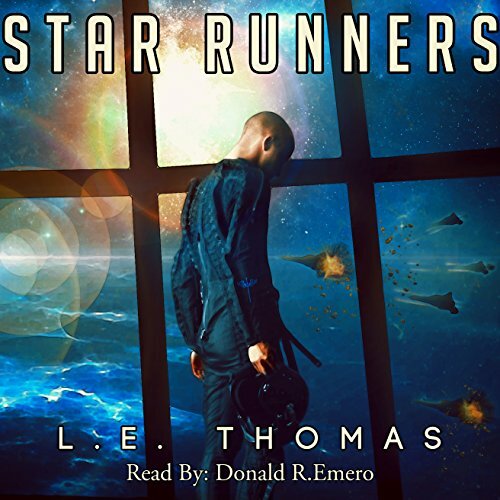 Author Thomas allowed the story to grow organically, refusing to rush through the pre-sci fi scenes and never allowing the main character to be a Marty Stu male wish fulfillment fantasy. Although not perfectly written, I greatly enjoyed Star Runners. Story: Austin Stone is approaching graduation from high school with a growing awareness that his future has few options other than blue collar drudgery: his grades are ok, he is decent at softball, but fails to really stand out at anything. Financial constraints mean college is out of the picture and his mother is still grieving from the loss of his father several years past. His one escape: the sci fi based Star Runners game. He, along with best friend Josh, has made it to the elite server; he's even managed to defeat uber player Scorpion. When a special college comes calling with a full scholarship dangling, he knows he has one chance to change the course of his life. But the school is much more rigorous in its demands - even harsher than a military school. As students begin to drop out one by one, he begins to question himself and his abilities. Until the day he is taken to a secret basement and then to another world - one of many in need of defense against ruthless pirates. The Star Runners game might just be real. Although the premise of the Last Starfighter is intact (Read: boy excels at video game that is secretly a recruitment agent), this book has much more depth. We're given a full back story and quite a bit of character growth across the entire story arc. I found that the more I read about Austin, the more I really liked the character. At this beginning, he starts off fairly unlikeable - a rather clueless but earnest loser. But as he faces trials at home, at the school, and then in space, with each triumph or defeat, he learns. Those expecting a Mos Eisley assortment of aliens will be disappointed - all are humanoid. Nor do we get to the sci fi aspect until the last 20% of the book. A chunk of the book is dealing with the academy - difficult curriculum, bullies, friends, foes, and general growth. It makes the accomplishments (and failures) in space much more believable and realistic since we were able to see all the history that goes into each of Austin's actions. The only let down for me was that I listened to the audible version and the narration was a bit odd. The narrator did a decent job but had such a strong Minnesota/Canadian accent that it created a dissonance between Austin being from Atlanta but talking like an extra from the movie Fargo (minus the 'youbetchas'). I'm looking forward to reading book 2. So this book rehashes a bunch of storylines, personal interactions, events. I get the sense that the author took all the movies and books he has read/seen since the 80s and put them all into the book. Its an "ok" storyline. I didn't cringe too much. The relationships between characters seem frozen...umm, cold...umm, forced...rehashed from an 80s drama. The reader didn't help to mitigate the flaws in the book. It was difficult to separate individuals and the overall tone was monotone and depressing. Its not the worst thing I have ever listened to however. It does burn away some time. It might work for you, it really didn't for me. Good concept, but a lot of issues. The Main Character spends a lot of time narrating the story, rather than actually doing anything, it would be good if he got on with doing something. A Lot of the secondary characters also just bounce in and out of Austin (the main characters) life so randomly that you never really get a strong connection or feeling for them, and Austin seems to forget them like they didn't exist for him, even though at the time, they seem to be important in some of the dialogue. It makes it both confusing, and difficult to get a real liking for Austin.SPOILERS****: The other major issues include things like this is meant to be a Military book, but there are a lot of un-Military actions - such as bullying and fighting in the main cafeteria, with no ramifications. Nubern, (one of the better characters I might add), seems to be both a commanding officer to Austin, a mentor and a friend. It is very confusing as this is not really possible in the real world. There are a lot of other points, like they suddenly start saluting out of no where, without being taught. They have this major space station, that is known to get attacked by pirates, and be a threat, but it is only protected by 2 fighters, with no other defences? US Carrier Groups have so many defences around them that they have trouble moving in the water. If the station is so important, with so many people, why only 2 fighters??Physics... Lasers cannot be seen in space, sound cannot be heard in space, for objects to be seen with the naked eye in space they have to be so close its just not funny. They would not be close enough that you could see 2 ships shooting at each other, people being blown out of a starship and witness the people coming out of a ship and SEE what is going on IN the ship. Not without drastic effects onboard the station at the same time. And also, why is every Alien humanoid? 2 Arms, 2 Legs etc And my favourite bit, every female is good looking too - alien and human alike! Seriously?Yes this is Sci-Fi, and it requires a certain detachment from reality, but, there also needs to be some believability for that detachment to take place, otherwise the story is just no good. What was most disappointing about L E Thomas’s story? The lack of research that went into writing the story and thus the actual believability of the story. If you could play editor, what scene or scenes would you have cut from Star Runners? I wouldn't have cut scenes, I would have focused more on making sure that the book was more accurate, researched better, and had better editing for spelling errors. This should have been much better for the concept it was. The Narration was exceptional though, they did a really good job. There was no space in the questions asking about the Narrator. Emero did a fantastic job with voices, good range with both male and female, clear and concise language. It was disappointing as the narration was so good, but the story had so many issues. This reader needs to be beaten. It is unbelievable, that this Rader cannot pronounce the word "sword quote. I will do my best to avoid getting this narrator ever again. Who gets paid to read and pronounces the W in sword?